I am so happy that Passover is over and I have my kitchen back to normal. I have a love/hate relationship with Passover, and I’m just ready for some more low-key time in the kitchen. 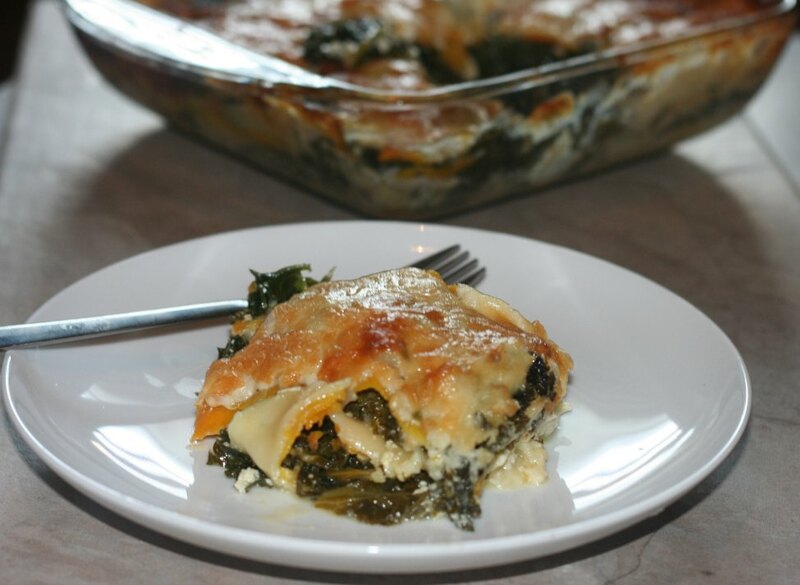 This fabulous lasagna brings two of my favorite ingredients together. I love butternut squash and kale in so many ways, be it a hash or a salad. For some reason, they just go together! 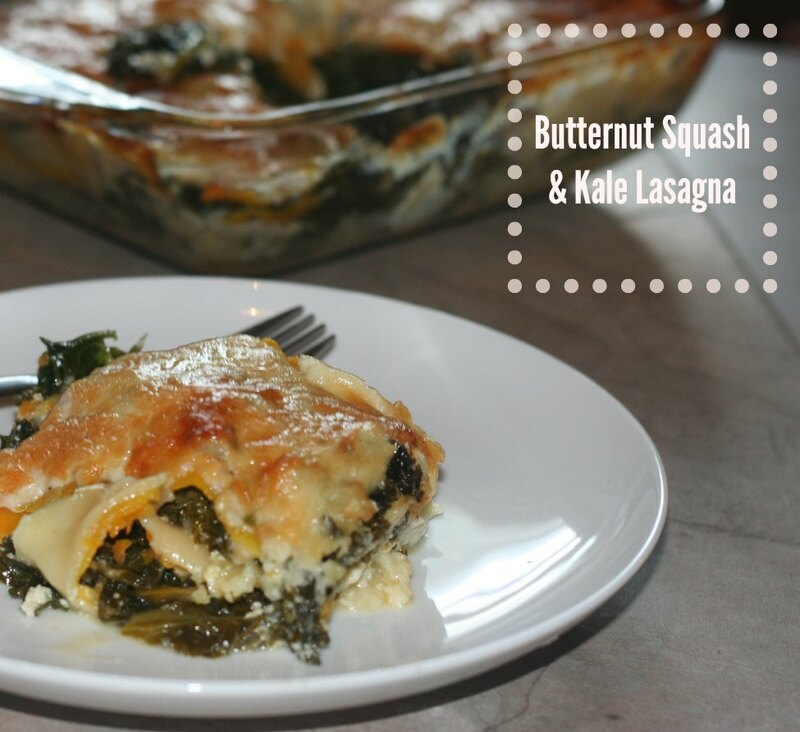 This squash was actually purchased for Passover and I had intended to turn it in to this fabulous kosher-for-passover lasagna from Joy of Kosher. It was a huge hit last year, but I just didn’t get the chance to make it this year. So this dish is somewhat inspired by that amazing lasagna. I like to use the no-boil lasagna pasta sheets because I’m lazy it skips one long step and they seem to work well. I started by cutting down the squash. I peel off the hard skin and then using my trusty OXO peeler, I peel long strips of squash, using the full length of the squash. 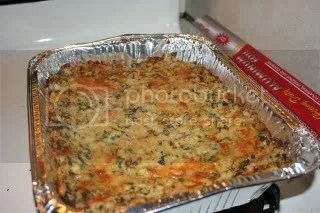 For this lasagna, used around 3 cups of squash strips, but you can certainly use more or less. I then cooked my kale and white sauce simultaneously. I lightly sautéed the chopped kale in olive oil with fresh garlic. I didn’t need it to wilt completely. I just wanted some of the raw edge off of the leaves. While the kale cooked down, I tackled the white sauce. I heated up some olive oil in a pan with garlic, sage, thyme and chopped onion. Once they were soft, I added some flour to the mix, cooked that a bit and then whisked in some milk. Once the mixture thickened, I added some freshly grated parmesan cheese, salt and some black pepper. I remove both of the pans from the heat. I then got to work on the lasagna. I layered each of the ingredients in my pan. 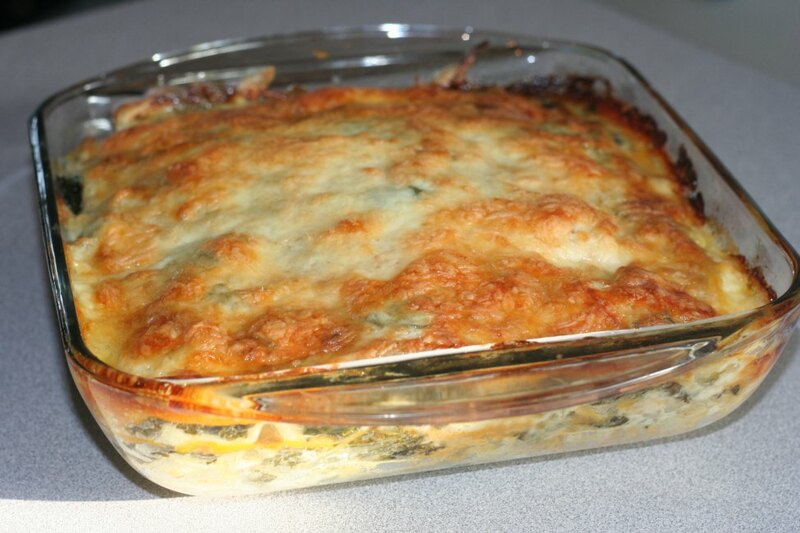 This recipe makes a 9×13 or two 8×8 square pans of lasagna. I used the square pans because they were more easily accessible after I was unpacking my kitchen from Pesach mode. I ladled some of the white sauce on to the bottom of the pan. I then added the pasta sheets. I spread some ricotta cheese over the pasta. I then added the chopped kale, then the thick layer of squash strips, then some sage leaves, then a small sprinkle of mozzarella and then more white sauce. I repeated this layer and when the pan was full and I used up the sauce, I topped everything with shredded parmesan cheese and more mozzarella. I also sprinkled on some more herbs and black pepper. I baked everything in the oven until the cheese was bubbly and beginning to brown. We dug in. Amazing! My husband and daughter had two helpings! Totally making this dish again! Cut the butternut squash lengthwise. 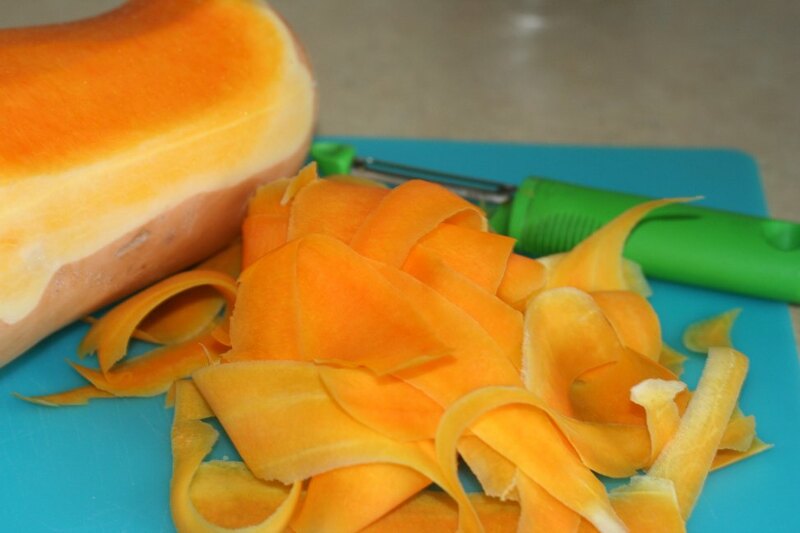 I use the peeler to get thin slices of the squash. Peel about 3 cups of squash and set aside. Heat up the olive oil in a saucepan and add the chopped onion, garlic and herbs. Once the onion and garlic have softened, add in the flour. Whisk quickly and then turn the heat to medium-low and whisk in the milk. Let the mixture thicken and add in salt, pepper and parmesan cheese. Remove from heat. 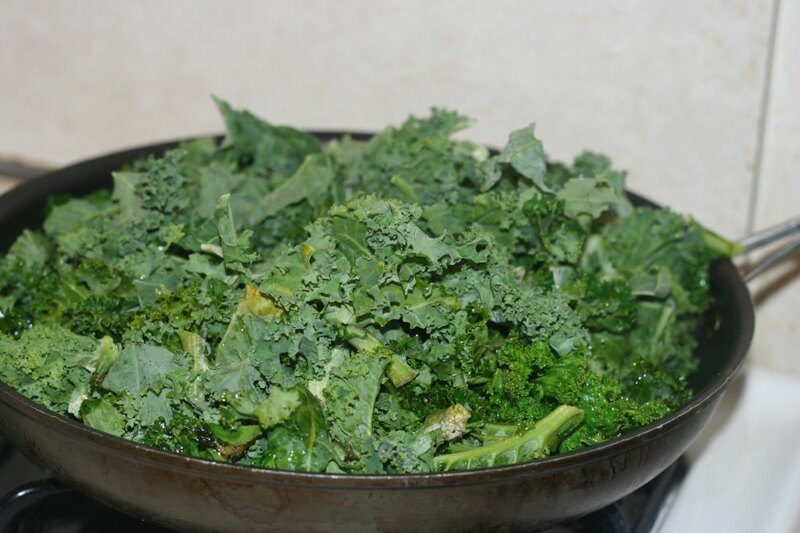 Heat up the oil oil in a large pan and add in the garlic and kale. Let the kale saute a bit so it softens. You are just trying to get the edge off a bit. 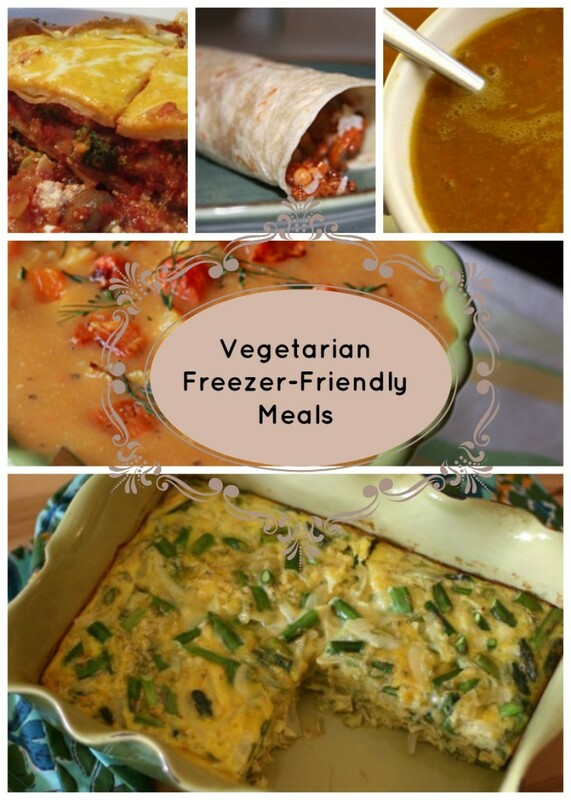 You don't need it to cook down completely. In a 9x13, ladle a bit of the white sauce to cover the bottom of the pan. Lay down the lasagna noodles and spread a layer of ricotta cheese over the noodles. Next, layer the kale then the butternut squash strips with some sage. Sprinkle a small amount of mozzarella over that and then ladle some more white sauce. Repeat the layering process again. For the final step, ladle the rest of the sauce over the pan and then sprinkle on some more mozzarella and parmesan. Sprinkle on some black pepper to taste and some extra chopped sage and thyme. Bake for around 40 minutes, or until the cheese is bubbly and beginning to brown. Recently, I have been on this casserole kick. Don’t know where it came from. I didn’t grow up with casseroles. 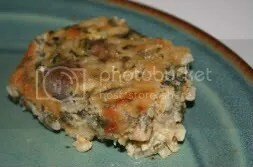 When I hear the word “casserole,” I think of Paula Deen and her twang as she talks about adding mayonaisse and cream of mushroom soup to cans of green beans. Definitely not my kind of cooking. The other kind of casserole I kind of know are the hotdishes of the tater tot variety that I use to see at various Minnesota potluck dinners. Again, not my taste. Though I do love tater tots. One day I will turn tater tot hotdish in to a healthier me kind of dish. This morning I cooked up some brown rice, and had a nice vegetable market haul sitting in my fridge. I decided to elevate the casserole and the brown rice in to a mighty tasty dinner. Behold, the healthy and hearty casserole! In a large pan saute the mushrooms in some olive oil. Add a bit of salt. Stir. Add in the onions and garlic. Saute a few minutes. Add in the spinach and the beans. Let some of the liquid evaporate. Add in the rice mix well. In a separate bowl, mix together the eggs, sour cream, cottage cheese, shredded cheese, and spices. Combine the rice mixture and cottage cheese mixture in a large bowl. Stir until well combined. Pour mixture in to baking dish. I used a 9×13 and a 9×9. Sprinkle with 2/3 of the Parmesan cheese, cover with foil and place in oven for 30 minutes. Remove foil and bake for another 20 or 30 minutes more or hot throughout and golden along the edges. Sprinkle some of the chopped tarragon, and the remaining Parmesan.